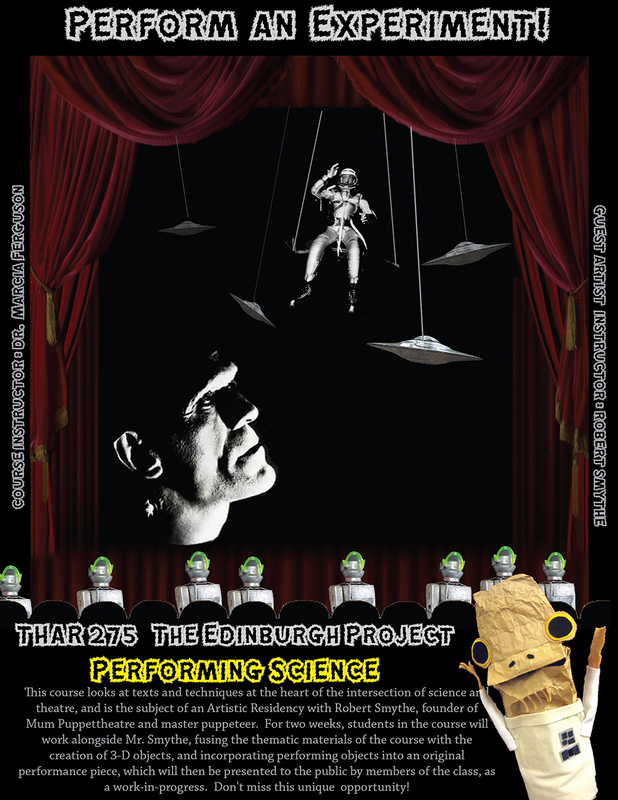 The course provides an overview of the evolving interface between science and theatre, and serves as a platform for the creation of an original performance with this theme at its heart. Our investigations will be grounded in a) various foundational philosophies of art, that theorize the encounter between the spectator and the work of art (Aristotle, Langer, Dewey, Brecht), and b) improvisatory performance research, as we seek to embody this nexus through performance. We will read plays that intersect with science in various ways (such as Brecht’s Galileo, Stoppard’s Arcadia, Auburn’s Proof, Durrenmatt’s The Physicists, and Buchner’s Woyzech). We will also become acquainted with contemporary research on theatre and nerocognition (McConachie, Blair, Pizzato) exploring scholarship on relationships between brain functioning, creativity, acting, and audience reception. Recent investigations by neuroscientists into the mind/body connection, which has fundamental implications for the work of the actor, shed light on biological and neural functions that create consciousness, the sense of self, and empathy for the other. The goal of the course is to engage these concepts by using them in our own interpretations of texts, and to find ways to maximize their usefulness to theatre practitioners, using them as “raw materials” towards the creation of an original performance piece. The course is also the subject of an Artistic Residency, sponsored by the Theatre Arts Program, with Robert Smythe, founder of Mumpuppet theatre, and master puppeteer. For two weeks, students in the course will work alongside Mr. Smythe, fusing the thematic materials of the course with the creation of 3-D objects, with the goal of incorporating performing objects into an original performance piece, which will then be presented by members of the class as a work-in-progress, on Thursday, April 16, 2015. The course also features field trips and in-class visits with practitioners. Dates and times for required attendance at the Artistic Residency portion of the class, which will fall outside of class time, are TBA.